Marital Status: Unrevealed, probably single. 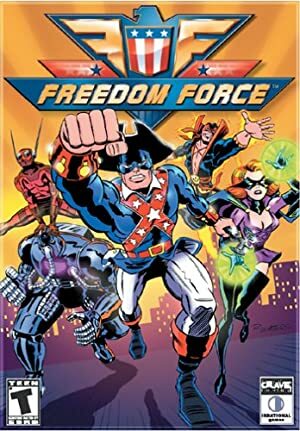 Group Affiliation: Freedom Force, formerly the Manhattan Project. 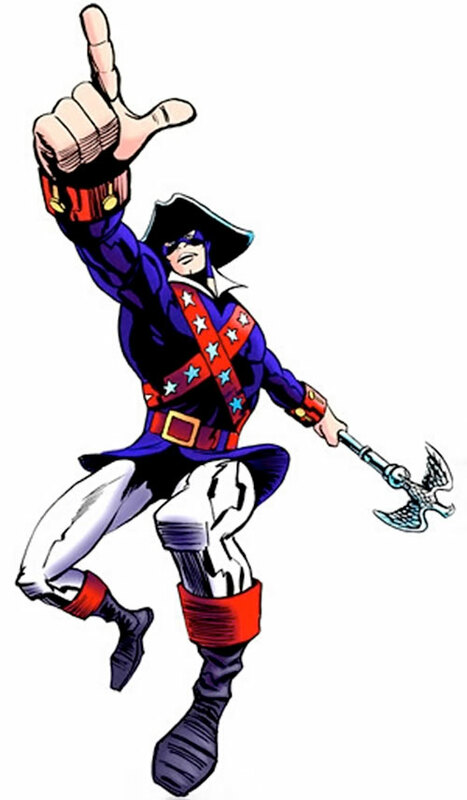 Gifted with strength and endurance beyond human, and with his battle staff Patriot and bracers he named Vigilance, Minuteman is a classic low-level brick . More than capable of lifting and tossing (for a short distance, at least) the typical automobile of the 1960’s, he can also withstand considerable punishment. He is able to launch off the eagle from his staff as a stunning attack (“Patriot Throw”). He can deflect and even reflect bullets and other projectiles with his bracers. As a former scientist in the Manhattan Project, it can be assumed he is well above average in knowledge of nuclear physics. But since he was not Project Director, he is not to the level of Fermi or Oppenheimer . He is also a powerfully charismatic man, able to inspire his comrades to shake off opposing powers and get up to continue the fight with just a few words (“Rally the Troops”). Corny at times, he still has become the unwilling leader of his world’s most prominent hero team. A scientist with the Manhattan Project, he was let go when a co-worker named O’Conner accused him of spying. This embittered him, and he withdrew from public life. Approximately 16 years later, Styles was in Patriot City Park when he overheard a conversation between O’Conner and a known Russian spy named Sukhov. O’Conner was apparently selling state secrets. Styles was spotted, and Sukhov shot him. Dying, Styles managed to crawl to the statue of the minuteman in the center of Patriot City Park. To his eyes, the statue seemed to glow with a bizarre purple radiance. Though he didn’t realise it back then, the monument had recently been bathed in the alien mutagen Energy X.
Styles reached out with his last ounce of strength to touch it – and felt strength coursing through his form! The experience renewed his health as well as his faith in his country. 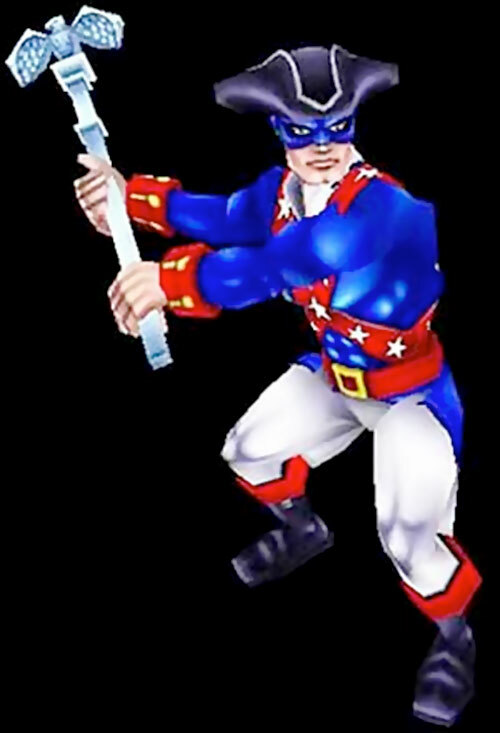 Gifted with considerable superhuman strength, endurance, and other abilities, he fashioned a red white and blue copy of the outfit worn by the Minutemen, adding a dark blue mask. 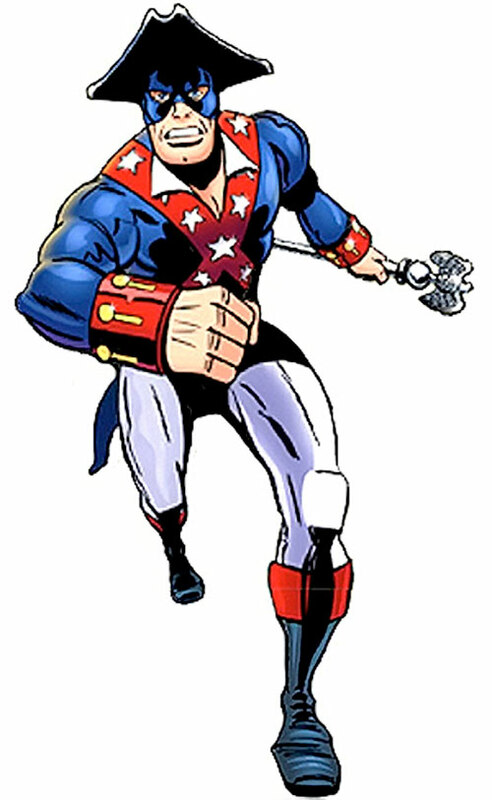 He would later team up with Mentor, Man-Bot, and El Diablo to form the hero team Freedom Force. Frank Styles was originally an elderly man, dependant on his cane just to move around, and dressed somewhat shabbily. After his transformation, he is a muscular man with a square jaw, black hair, and blue eyes. He very much resembles the depictions of Steve Rogers, but with longer, black hair pulled back into a Revolutionary War era style queue. His costume consists of a blue jacket with red belts covered in stars crossing his chest, white trousers, and blue boots with red cuffs. 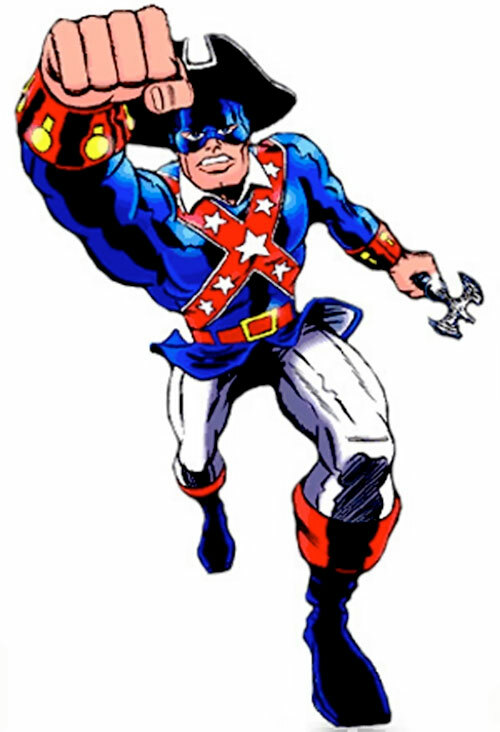 On his wrists are his red and gold bracers (“Vigilance”), and he wears a dark blue tricorner hat with white trim over a dark blue half-mask. He is almost never seen without Patriot, his staff. Minuteman is, in many ways, completely over the top. He has an absolutely unwavering dedication to the United States, and punctuates his fights with the battle cry, “For FREEDOM!”. He is prone to long-winded speeches peppered with purple prose, calls his friends “chum” and younger males “lad”. Even in the early Silver Age that the game is set, he seems quite cheesy. Being fully indoctrinated in the anti-communist agenda of the 50’s and 60’s, he initially thinks the “global threat” Mentor wanted to form Freedom Force for was Communism. However, he is not entirely a knee-jerk reactionary – he seems quite willing to accept the assistance, of sorts, of a Russian foewoman who briefly teams up with them after her employer is shown to be planning betraying her. She was relatively unattractive, so that card probably wasn’t played. He is the de facto leader of Freedom Force, though he doesn’t feel comfortable in that role when dealing with the public. It’s not so much that he was chosen, or that he wanted to be the leader. But rather that when the situation gets tight, he starts barking orders, and the others jump to follow them. As much of Minuteman’s character derives from McCarthy era politics and World War 2, it would be best to leave him in this era. It is unclear whether or not his rejuvenation was simply a reversion of aging, thus meaning he would age normally, or whether he would remain young as long as the Energy X remained in his system. A popular fan theory is that those physically altered by Energy X, like Minute Man, no longer age, but Irrational Games has stated it’s more fun to watch us speculate than to clarify the situation. If this is so, then he could be found in nearly any era. He would presumably evolve a bit, though. Note that in the 1960’s, a dollar had considerably greater buying power. Thus, 0 AP’s of money does not represent $25, but rather approximately $4. A resource for estimating costs for the time period can be found at eh.net . Expansive HQ (the Freedom Fortress), Leadership, Popularity, Scholar (Nuclear Physics), Schtick (Devastator), Rich Friend (Mentor). MIA (assuming enemies are ’Communists’ in some way or another). Patriot [BODY 12, EV 04 (09 with STR), Mind Blast: 05. Though described in the source material as ’semi-sentient‘, there is no clear evidence Minuteman’s battle staff (formerly just a cane) is anything more than a very durable stick. Oddly enough, the eagle at the top of his cane is able to launch off as a ghostly bird that is very likely to stun weaker opponants quite handily]. Vigilance [BODY 10, Reflection/Deflection: 06. Don’t ask me why he named his gauntlets… Reflection/Deflection only applies to projectile attacks or electrical attacks]. A character with the Devastator Shtick is extremely adept at critically injuring his opponents. Care should be taken by the GM when allowing this Shtick since it potentially might disbalance the game, although it really is not much more powerful that the theoretically opposite No Vital Areas Advantage. It allows the character to very easily inflict Critical Blows and Devastation Attacks upon his opponents, while not necessarily having to have huge skill levels (he might, for example, be an expert at anatomy seeing multiple attack points to choose between). In Minuteman’s case, at least, he must do nothing but concentrate for a full phase before using this schtick (representing his “300 Percenter” power). Helper(s): Peter S Piispanen, ChaplainChris, Roy Cowan, Niles Calder.